The U.S. dollar has been under pressure for a while now. But, don't expect the decline to continue forever. Is the weakness in the dollar a problem for the Fed? All else being equal a weaker currency should cause inflation pressure, as foreign goods are now more expensive for local consumers/companies to purchase. Indeed, in its simplest terms, inflation is the decline in value of a currency. The flip side of prices generally rising is that your currency can't buy as many goods as it could before. When we say a currency has "weakened" we are saying it can't buy as much in foreign currency as it did before! However, I think the dollar has fallen for completely different reasons, and indeed reasons that probably can't persist for much longer. Is the Dollar Weaker or Are Other Currencies Stronger? Currency analysis is always tricky because both sides of the equation are in motion. The dollar is much weaker against the euro, for instance, but which way is the causality? Are conditions in Europe driving their currency higher or are conditions in the U.S. driving our currency lower? A simple way of looking at this is to consider how a basket of commodities are trading in dollar terms. If the U.S. currency were falling because of U.S. conditions (say, overly easy monetary policy), then commodity prices would be moving higher at about the same pace as the currency was moving lower. The chart below shows the trade-weighted dollar index (DXY) vs. the CRB commodities index, a broad basket of traded commodities. 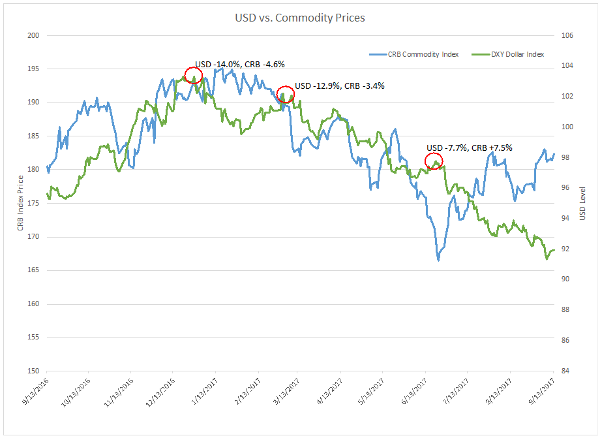 For most of the last year, the dollar and commodity prices have been moving in the same direction. I.e., the dollar gets weaker and commodity prices fall. I circled a few local highs for the dollar and showed the percent change from that moment to today. The only exception to this positive correlation pattern happened right around the same time as a big dip in oil prices, which also probably didn't have anything to do with domestic conditions. You get the picture. So something is going on in the U.S. that is driving our currency lower. Turns out the answer is quite simple. 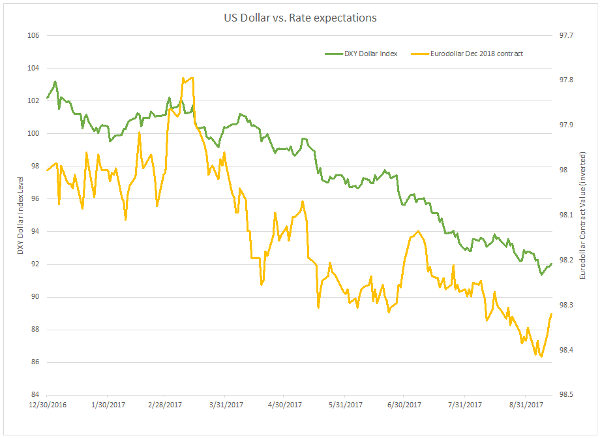 A quick look at intermediate-term rate expectations vs. the dollar shows that it is really interest rates that are driving the currency. The green line is the DXY index, same as used in the prior chart. The yellow line is a Eurodollar futures contract, which is essentially a way to bet on future levels of LIBOR. This contract pays at a level of 100 minus the LIBOR rate at expiration, which in this case is December 2018. So if you buy the contract at $98.5, you profit if rates are less than 1.5% and lose money if they are higher. I inverted this contract level on the chart, so it is easier to see the correlation. Notice that as recently as March, this contract was trading at $97.8, implying the median expectations for short-term rates was 2.2% at the end of 2018. Now it is just $98.3, or a rate expectation of 1.7%. Basically, that means we've priced in about two fewer rate hikes between March and now. We can easily see here that as rate expectations have been falling, the dollar has been weakening. Can rate expectations in the U.S. keep falling? Assuming the economy keeps growing, probably not. It seems extremely unlikely that the Fed would just hold pat for the next two years. Even if inflation doesn't meaningfully move higher, if we keep getting job growth the Fed is going to want to pull accommodation out incrementally. Could the economy and/or inflation weaken just enough for them to hike zero times? Maybe, but that's a very tight needle to thread. My view is that any sustained weakness in the economy would probably bring us to a stall speed, which would put us in recession. While that could certainly happen over the next 12-18 months, it doesn't seem possible immediately. Business confidence is high, job growth is still strong, capex spending is finally coming back, etc. Near-term, there isn't likely to be much data suggesting a sudden slowdown which could drive rate expectations lower. Plus while we don't know who the next Fed chair will be, whoever it is won't be more dovish than Yellen. Of the serious candidates, the current chair would almost certainly be the most dovish. So if it is anyone else, expect higher rate expectations and thus higher USD. If it winds up being Kevin Warsh, which incidentally is who I'm expecting at the moment, the USD could be substantially higher. Lastly, sentiment is very much lined up on the side of dollar weakness. The Barclays Global Macro Survey (a survey of market participants) listed USD as 44% of the respondents favorite currency short (question was only asked of those focused on foreign exchange as their primary job). The next highest response was the yen at just 20%. I think this creates a great opening for a contrarian USD long with a 2-3 month horizon. That should be a short enough horizon that we won't see any big change in the intermediate-term economic outlook, but we will likely know who the next Fed chair will be. This commentary originally appeared on Real Money Pro at 1:00 p.m. on Sept. 13. Click here to learn about this dynamic market information service for active traders.